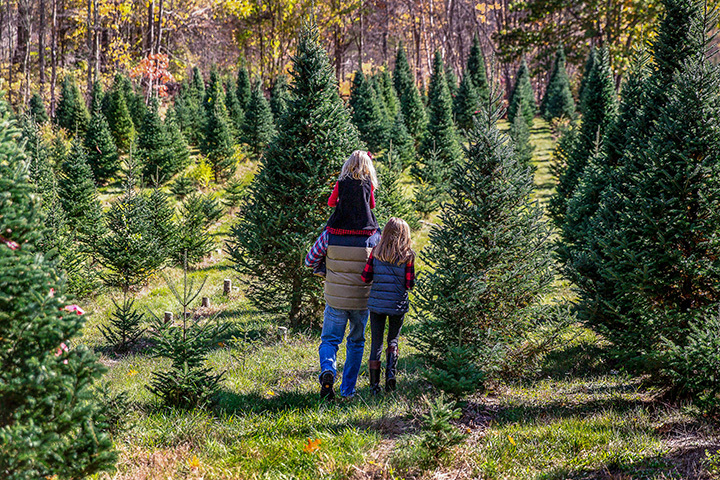 The 6 Best Christmas Tree Farms in West Virginia! There’s nothing like the smell of fresh pine to stir memories of fresh baked goodies, holiday music, and family. Whether you like to cut your own or prefer the pre-cut variety, you’ll find great suggestions below from one of the best Christmas tree farms in West Virginia. Besides meeting some of the friendliest and most helpful folks around, you’ll enjoy complimentary hot chocolate and treats at many of the locations. It’s all in the spirit of Christmas! Get your family together and come pick out a Christmas tree at Berry Fork Enterprises in Heaters, West Virginia. Besides helping the local economy, you’ll be getting a beautiful fresh tree to take home and decorate for the holiday and make memories that will last a lifetime. Family owned and operated, Berry Fork Enterprises offers great suggestions and tips to make your holiday celebration great. Friendly and helpful staff will make sure you get just the right tree, and when you’re done, they’ll help load it on your vehicle so you can be on your way. Located in the beautiful Appalachian Mountains of the Eastern Panhandle in Maysville, West Virginia is May Tree Farm. Carrying on the tradition of providing the best experience and products, May’s has five different types of trees including pines, fir, and blue spruce. You can select a pre-cut Fraser fir or journey through the field to select your own. Don’t worry if you don’t have a saw. You can borrow one there. You’ll have friendly helpful assistance to shake out old needles and drill and bale your tree before you load it on your vehicle. You can also purchase a live tree in burlap to plant outside after the holidays. For over 30 years, Mulkeen Landscaping & Tree Service has been providing great service for all your landscaping needs. In addition to this service, they have their own tree farm where you can bring your family and friends and make a tradition of cutting your own tree from the 10 acres of beautifully shaped and reasonably priced trees. Open daily from Thanksgiving until Christmas Eve, they’ll be happy to help with tips and tricks to keep your tree fresh all during the season. Bring the beauty and aroma of the outdoors into your home this holiday season with a fresh cut tree from French Creek Christmas Trees in French Creek, West Virginia. Friendly folks will help you choose the best tree for your needs and give you tips on how to care for it in your home. Trees typically range in price between $30 and $40 and provide a fragrant and beautiful central focal point to your holiday decorations. Make a trip to Mt. Zion Nursery in Fairmont, West Virginia, part of your holiday tradition. Stop by the family-owned nursery and tree farm any time before Dec. 22 and cut your own tree. Afterwards, enjoy free hot chocolate, coffee, and candy. Little ones can make a holiday craft, and you can get ideas on how to decorate your home. For over 40 years, Mt. Zion Nursery has been a favorite stop for Christmas trees. Visit Meadows Farm Nurseries & Landscaping in Harpers Ferry, West Virginia, for all your holiday decorations. Family owned and operated, Meadows Farms has received a No. 1 rating by Garden Center Magazine. One of largest retail businesses in the country, personal attention and customer service are valued and continue to bring people back year after year. The friendly folks at Meadows Farms want you to have the merriest holiday season, and offer the best selection of pre-cut and live trees. Pick up a colorful poinsettia before you leave for an added touch to your family table.